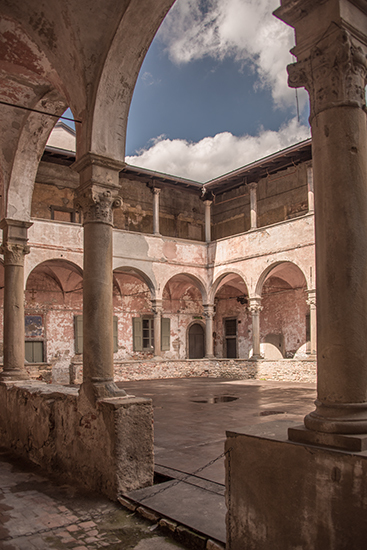 The cloisters that are attached to the Sant'Agata nel Carmine, were built in the 14th Century and were, at that time, part of the Monastery of the Teatini Fathers. 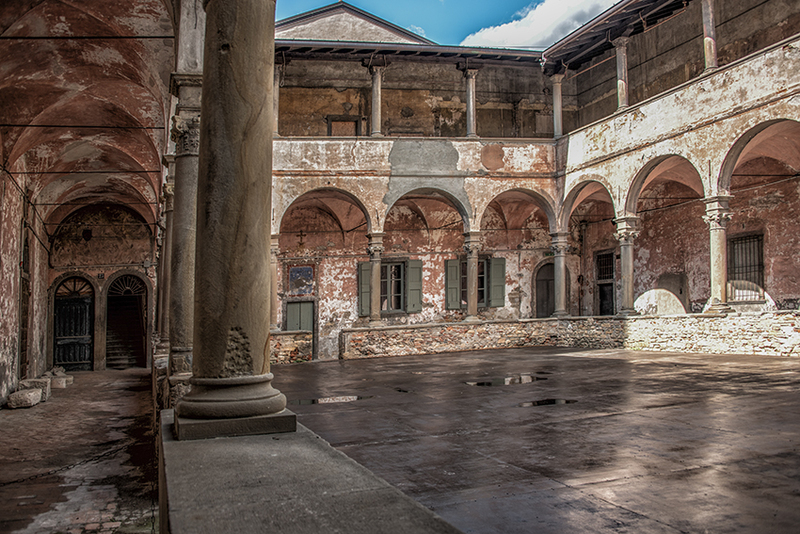 In the 18th century, these cloisters became part of the monastery of the Teatini fathers, which dates back to 1608. The monastery was suppressed in 1797 and at that time, also was the small church of Santa Maria Annunciata. Reference information describes this as a monastic complex with an irregular polygonal plan with a large rectangular cloister. The cloister is on two floors, although I was only able to walk about the ground floor. There are round-arched porticos supported by columns. The vertical structures are in mixed masonry of stone and bricks while the horizontals are made of masonry vaults and wooden and concrete floors. There are remains of the original Roman walls along via Boccola. The church dedicated to S. Agata has a single nave, covered by a barrel vault, divided into five bays with chapels side. The façade is divided into two horizontal parties, the lower one in square-faced stone ashlars on Zandobbio's marble base. I always find it interesting as to what has happened to cloisters over the hundreds of years they have stood. Here, with the Carmine Cloisters, in the nineteenth century they were modified and used as a prison as one of project of Leopold Pollack (1802). 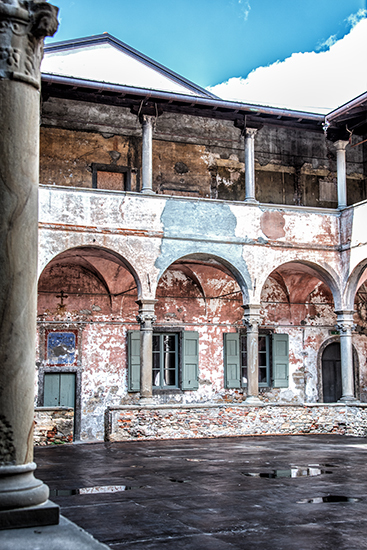 During the Napoleonic occupation, Bergamo transformed monastic convents into jails. The cloister faces the inner courtyard on the ground floor, in tuscan order with pillars alternating with arches with overlapping architraves and frames, sandstone-based orthodox sandstone, the shape of the pillars and capitals. The building has a mix of architectural styles. 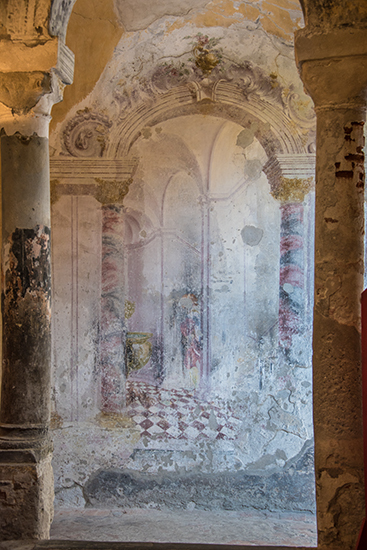 The interior still retains frescoes from the 18th century. 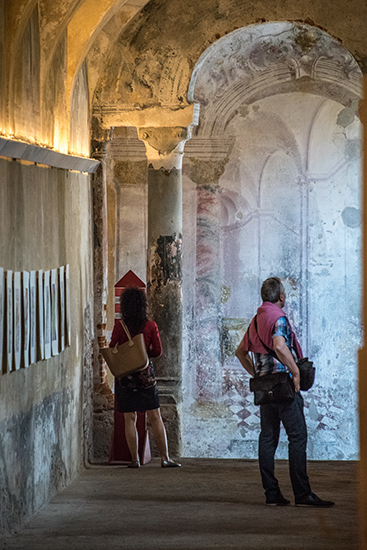 Today the buildings are used for exhibitions and guided tours. It is also used for theatrical performances and outdoor cinema. Therre is nothing from the street that would indicate the beauty of the interior. I wandered in thinking it was an interesting exhibition. As I walked down a long connecting hallway, I walked out into the impressive old cloister.